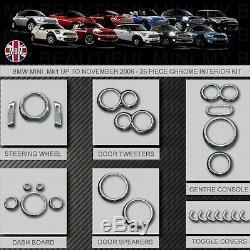 WE HAVE INCLUDED IN THIS KIT TWO GENUINE BMW MINI DIRECT REPLACEMENT CHROME DOOR PIN SURROUNDS. THIS MAKES THE KIT COMPLETE. 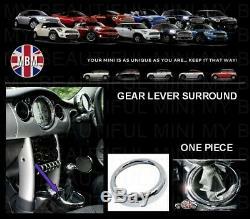 VISIT OUR E-BAY SHOP - FOR MORE ACCESSORIES FOR YOUR MINI. YOUR MINI MAKEOVER STARTS HERE!! + 2 CHROME DOOR PIN SURROUNDS. 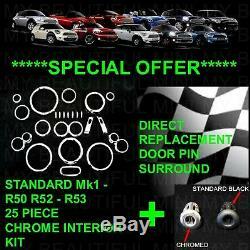 Mk1 - GEN1 - R50 R52 R53. R50 Hatchback upto November 2006. R52 Convertible upto March 2009. 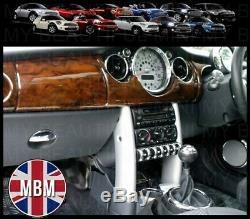 R53 Cooper S upto November 2006. This kit contains the following. 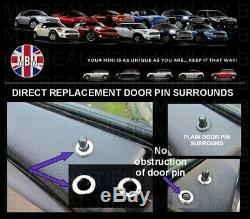 2 X DIRECT REPLACEMENT DOOR PIN SURROUNDS (Only supplied by us and not available from other sellers). 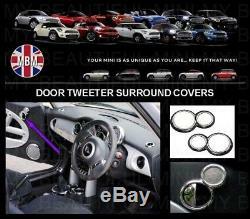 2 X DOOR SPEAKER SURROUNDS. (These will not fit the Mini with Harmon Kardon Upgrade door speakers). 2 X DOOR HANDLE UNIT SURROUNDS. 1 X GEAR STICK BASE SURROUND. 1 X FRONT CUP HOLDER. 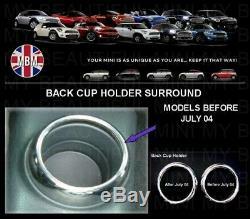 2 X REAR CUP HOLDER (One for models prior to July 2004 upgrade, and one for models upto November 2004). 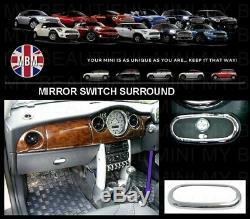 1 X MIRROR SWITCH SURROUND. 1 X CENTRE SPEEDO SURROUND. 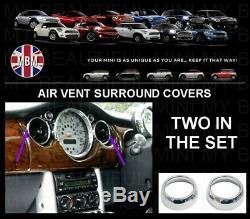 2 X CENTRE AIR VENT SURROUND. 1 X REV COUNTER SURROUND. 2 X HORN COVERS (Will not fit models witha sports steering wheel). 7 X TOGGLE SWITCH COVERS. 2 X DASH TOP AIR VENTS. 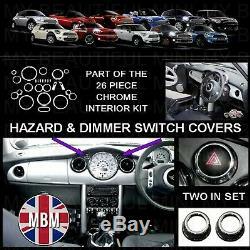 2 X HAZARD & DIMMER SWITCH SURROUNDS. Made from high quality ABS Plastic which has a reputation for durability, impact absorption and heat resistance. Guaranteed quality finish using chrome plating technology: will not rust, chip or break under normal circumstances. 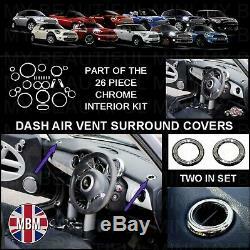 Easy fit - installed in seconds - Custom made for direct fitment, will fit over the existing dials, no modification or drilling needed. No tools required - Every kit includes 3M Acrylic Foam adhesive tape on the back of the cover to provide superior adhesion. No other product on the market like it. YOUR MINI IS AS UNIQUE AS YOU ARE KEEP IT THAT WAY. Are due to misunderstandings and can be easily resolved. 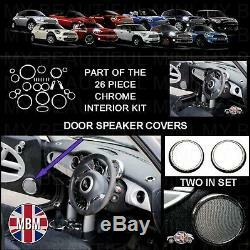 The item "BMW MINI Chrome Interior Dial Trim Kit 2001-2006 Cooper/S/ONE R50 R52 R53 25pc" is in sale since Friday, March 1, 2019.